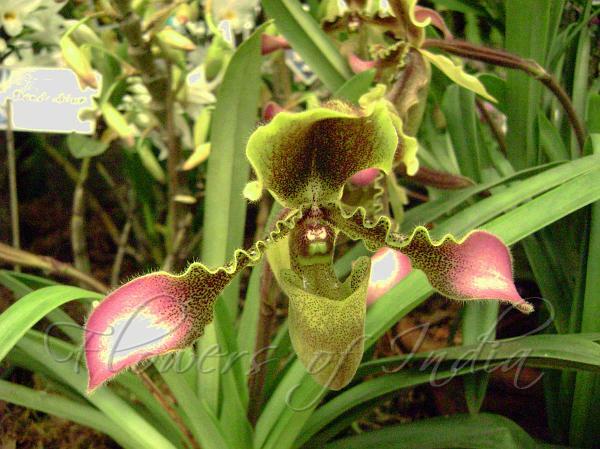 The genus name Paphiopedilum is derived from the Greek Paphos, a city on the island of Cyprus, and pedilon, slipper. commonly referred to as the Lady’s or Venus’ Slipper Orchids, so named from the unusual shape of the pouch (labellum) of the flower, which was said to resemble a lady’s slipper. The pouch functions by trapping insects so that they are forced to climb up past the staminode, behind which they collect or deposit pollinia. These sympodial orchids lack pseudobulbs. Instead they grow robust shoots, each with several leaves. These can be short and rounded or long and narrow, and typically have a mottled pattern. When older shoots die, newer ones take over. Each new shoot only blooms once when it is fully grown, producing a raceme between the fleshy, succulent leaves. The roots are thick and fleshy. Potted plants form a tight lump of roots that, when untangled, can be up to l m long. 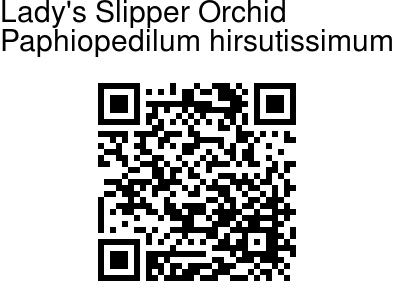 The Paphiopedilums are among the most widely cultivated and hybridized of orchid genera.